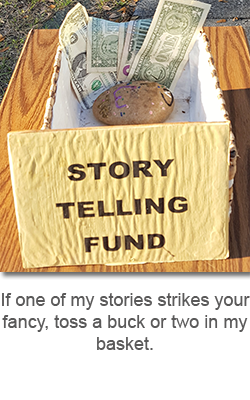 This entry was posted in Stories and tagged short story, storytelling on March 22, 2019 by jerrycowling. “Doctor Fulaybeans, I tell you he is not a beast! Merely misunderstood! At that moment the door opened, and the beast entered, wearing a purple satin top coat over his hairy body. Belle ran to him and planted a kiss upon his lips. When she pulled away, her lips were smeared with blood. The beast shook the doctor’s hand with his cloven hoof. This entry was posted in Stories on July 10, 2013 by jerrycowling. Bobby couldn’t believe his luck. His father was actually taking him to the drive-in movies to see Ben-Hur. All his classmates saw it in the walk-in theaters and raved about the sea battle and the chariot race. It showed this one guy scraping the skin off his leg trying to get his chains off. And a lot of guys fall off their chariots and get run over by the horses. This was great stuff. Bobby didn’t go to many movies since he turned twelve the price went up. The drive-in, on the other hand, were only a dollar a carload. They used to go to the drive-in all the time when Bobby’s brothers lived at home. Five people and only one dollar. His mother didn’t feel like going anywhere anymore. When Ben-Hur came to the local drive-in, Bobby tried to talk his father into taking him. It would be 50 cents per person, dangerously close to what the walk-in theater charged. So there they sat in their car in the darkness and waited for the screen to go black and the music to come up. By the time Ben-Hur’s boyhood Roman friend came home and tried to talk him into giving him the names of Jewish dissidents, Bobby’s father dropped off asleep, his head flung back against the seat and his mouth wide open. The snoring was deafening. When the soldiers broke through the front door to take Ben-Hur away for throwing a rock at a general, Bobby’s dad fell into the steering wheel, setting off the horn. A group of men charged the car. “We spent a whole dollar to see this movie! We want to hear it too! Wake him up! “Well, I don’t give damn if he gets mad or not!” one big man yelled as he jerked open the car door. Bobby’s father fell out face first into the gravel. The car horn stopped, and the snoring was muffled. The men went back to their cars. Bobby had a tough time concentrating on the rest of the movie. He even missed the part when the guy scraped the skin off his ankle on the boat, because Bobby kept looking at this father lying on the ground. The snoring stopped but if Bobby looked closely he could still see his body go up and down as he breathed. Mom would definitely be upset if he came home with daddy dead. He was supposed to mow the lawn the next morning. Bobby couldn’t keep up with the chariot race. He thought Ben-Hur had the white horses and the Roman the black, but he didn’t know for sure. By the time Jesus rose from the grave and Ben-Hur decided he didn’t hate anybody anymore, Bobby’s father coughed and snorted, sitting up abruptly on the gravel and then crawling back into his car. This entry was posted in Stories on May 18, 2013 by jerrycowling.